Now that it's February, it's a great time to look at your numbers. See what you did, be honest with yourself, and see what is working and what is not. You had your hypothesis for what will help you grow. Now you have the sample size to look and trim the fat. Do not wait to change, you have a month's worth of data and you can make those changes now! If you want to execute faster...it requires more focused work. Looking to get started in the world of drop shipping? Go to dropshiplifestyle.com. More advanced and looking to take yourself to the next level? Send me an email at [email protected] and I'll send you information about our upcoming retreat in Prague. 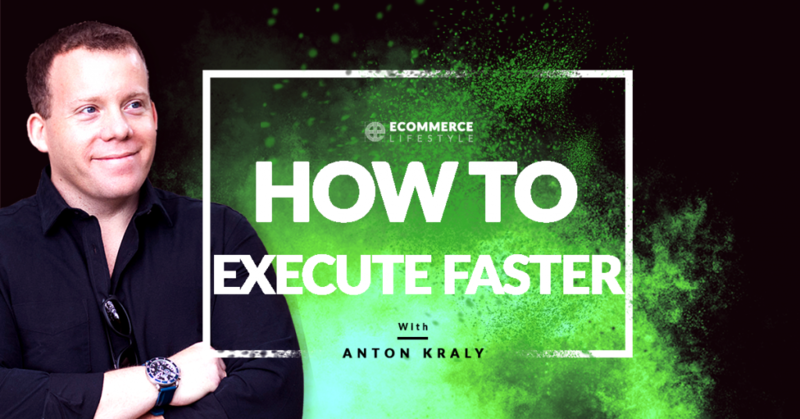 Good morning everybody, Anton Kraly here and welcome to another episode of The E-commerce Lifestyle podcast, from ecommercelifestyle.com. So I'm recording this right now on Monday morning, I think it's the fourth, February fourth, so right after the Super Bowl where unfortunately the Patriots won again. And it's crazy, I'm a Jets fan, so yeah, life is hard, but it's getting ridiculous now, seeing the Patriots win pretty much every year. So the good news is, that was easy money as far as the bet what I thought, so I was able to make some money on the game at least to help deal with the fact that they are officially the most winning team in Super Bowl history. But yeah, what I want to talk to you about today, as I head into the office, is something I was thinking about now that we are in February. Now that it's a solid month into 2019, and this builds on a lot of what I have spoke about in previous episodes and a lot of just what I believe and what I do, and yeah. So today, what I wanna talk about is how to execute faster, so how to get things done in less time. Now when I say this ties into things I've spoke about in the past, I've done episodes on goal setting. All right, I've done an episode on how to plan your year, I think that was probably like seven or eight episodes ago. I've done episodes about cutting the fat and just trying to remove all distractions and remove things that aren't necessary. I've done episodes about ... Yeah, again, our yearly planning, our quarterly planning, how we do it all. So the thing that I wanna really drive home in this episode though, is now that again we're a month into this year, it's a really good time to look at your numbers and to see how you're doing in comparison to where you wanna be. And then what's even more important to do is look at, "Okay, in the beginning of the year, the beginning of this new year, I said I was going to reach X, Y and Z goals. This was my growth target. Whether it's customers or revenue whatever it doesn't matter. And these were the things I was gonna do to help get there." Then look at the things that you did do and just be honest with yourself. Did you actually do them? And if you did, are they working, are they not? Which ones are working the best? Because what you wanna start to get a sense for, is where the real opportunity is. So let's just say you had three things you were going to do that were gonna produce X results. If that was your goal, look at those three things, see if you made an honest attempt at all three, and then look at which ones are driving most of the growth. And then now think, "Okay, is there anything that I can cut? Did any of them ... We really went all in, we did everything we could and it's not working, or it's not working as well." And if it's not working as well, does it make sense in this next month to devote your resources and your team's resources and your company's resources into what was that driving factor for growth? Because here's what you gotta realize, and it doesn't matter if you've been in business for one month or for 10 years, I deal with the same thing. But a lot of the times when we're doing our planning and we're setting goals, we actually give ourselves too much time to hit them. And we might not realize this, but you might have a goal again that you wanted to, let's say grow your business by 75% this year, which is what we're doing and maybe you think it's gonna take you until early Q2 to start hitting a lot of your targets. Well, maybe you could do it a lot faster. Especially now that you have data back from a whole month. So, what you're looking to do at this point, is basically just use the scientific method and look at what you had set out, your previous hypothesis for what was going to cause growth. Now look at your current results based on what you did in the data collected, and then look at what drove most of the growth, cut the losers, do more of what is working. Maybe implement what's working a little bit differently, maybe try some new angels with it. Maybe just put more time into it and double down on it, right. But whatever it is, doing that is gonna help you hit your goals a lot faster and execute faster in hitting them, rather than just thinking, "Okay, let's take a look at this again in early Q2 and see where we can adjust." No, you can make adjustments now because one month should be more than enough data. And this is true in anything, like I'm tying this into the messaging of yearly planning and quarterly planning and growth targets because I feel like that's an episode of the podcast I did recently that this ties into. But it really applies to literally, even if you're brand new, I'll give you an example okay? I have my online coaching program, Drop Ship Lifestyle. Just go to dropshiplifestyle.com, click on courses, you could see what that's all about, but we've helped over 10,000 students from over 25 countries, have thousands of success stories, just go to our reviews page. So yeah, it works. But with Drop Ship Lifestyle when students enroll, a lot of the time they email in or they live chat and they say, "How long is this gonna take me? How long until I build my first store? How long until I start getting sales?" And what my team knows to say is, "Listen, I can't tell you that, because the truth is everybody is gonna achieve that goal in a different amount of time." And it's not because of the material and the program, it's not because some people have more experience than others, it's just because of how you execute. And if you wanna execute faster, it involves really doing more focused work and on top of that, tracking what you're working on, which is why I was talking back to ... Circling back to tracking data, because if you can really be focused when you're putting time in, and if you can make decisions based on data you already have, then you're only gonna get better and better and better, and that's what leads to executing faster. That's what's gonna lead to expediential results. Do what you know you have to do, look at what's happening by looking at data, adjust from there, tweak everything and you're gonna see a lot better results than the person that waits until the end of the year, and maybe October and then logs into all their accounts and thinks, "Okay how are we doing in comparison to last year?" Well, some people can do that and be fine with their results, that's not what real winners can do, because the person, the guy or the girl, that is constantly checking what is happening and tweaking based on what is happening, they're gonna achieve what the lazy person can achieve in a year, they're gonna achieve that in maybe three months. Great book by the way, it's called The 12 Week Year. I'll admit, I skimmed through a lot of it 'cause there's maybe some unnecessary words, a little bit of bloat in there. But a book called The 12 Week Year, and it's all about this, just executing faster and achieving what takes some people a year, in three months because guess what? When you start having this mindset, when you start working with this mentality, you are literally going to be years ahead of the competition. And you're gonna be years ahead of where you would be normally. So, when you think of this like extrapolated out in the grand scheme of things over some time, literally in five years, you could be where one of your competitors would be in 20 years. So it's not just [inaudible 00:07:15] that compounds, it's what we work on, it's how we execute. So take this seriously, look at your past month of data, see what worked, see what didn't, apply what is working in as many areas as you can. Kep doing more of that, maybe tweak it a little bit to try to beat that control. Cut what's not working, and that's how you will execute faster and hit your goals in record time. So I'm at the office, I'm gonna head in and start my day, hope you have a great Monday and yeah, for everybody out there that's sick of the Pats winning, I'm with you. I'm with you. I hope that maybe the Jets get sold one day soon, but I don't see it happening because their ownership has too much money, and yeah. So, maybe the next five years. Maybe Gary V will take it over and make something out of him, but that's it guys. As always, if you're brand new to e-commerce, looking to get started and build a highly profitable semi-automated store in as little as 21 days, definitely go to dropshiplifestyle.com, click on courses and get enrolled today. Get started right now, and if you are a little more advanced, definitely come out to our [Prague 00:08:22] retreat. We're bring together over 100 people out in Prague in September. If you wanna be part of that, just send me an email, [email protected] Again, that's for people that are already part of Drop Ship Lifestyle, but that's it guys, I'm gonna head in and start the day and I'll talk to you all in the next episode of The E-commerce Lifestyle podcast. See you everybody.